Before an incident in Jodhpur, I planned to leave Bikaner for Amritsar, but after spending a month in India and witnessing first handedly the attitude of Indian men and dangers that traveling alone presented, I decided not to part with Sunil and my car and have him drive me back to Delhi, where I could spend the rest of my trip in the company of my Oxonian friends. After I finished a delicious breakfast at Hotel Harasar Haveli and said sad goodbyes to my travel partner Shu and the owner of the Haveli Mr. Bubbles (Mr. Vishwajit Singh Harasar) Sunil and I left for yet another leg of our journey. Sunil told me that his wife was very sick but he couldn’t drive all the way to Delhi on the same day so when we left Bikaner around noon, we proceeded to Mandawa village, located half way between Bikaner and Delhi. Somebody call it “the diamond in the dust”, some “town of living art” and perhaps it is indeed so, however, by the time we got there, I had very little time to explore its famous frescoed havelis. 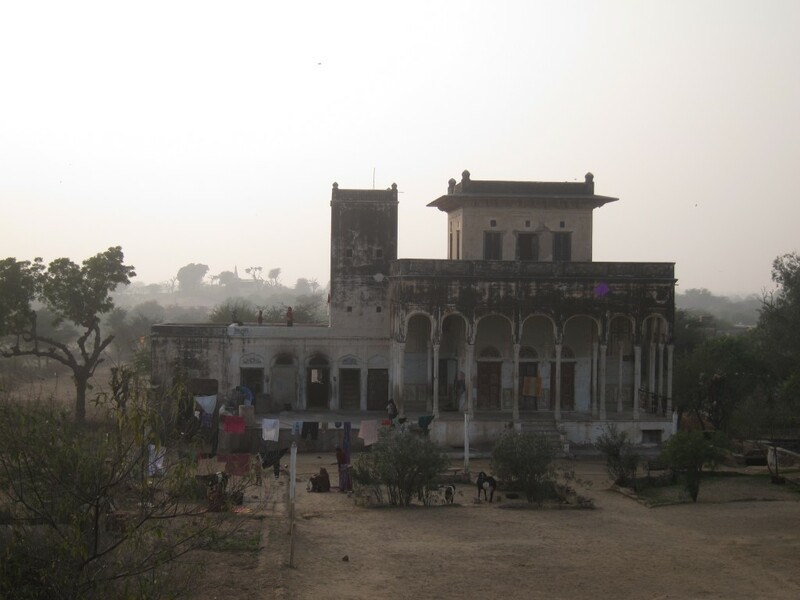 A remote principality in the center of Shekhawati region of Rajasthan, Mandawa was a trading outpost for the ancient caravan routes that stopped there on the way from China to the Middle East. The origin of the city goes back to the time of Mandu Jat, who founded Mandawa village by establishing a dhani (hamlet) and digging a well. The city was made a thikana in the mid of 18th century by the Bhojraj Ji Ka Subsub clan of Shekhawat Rajput. 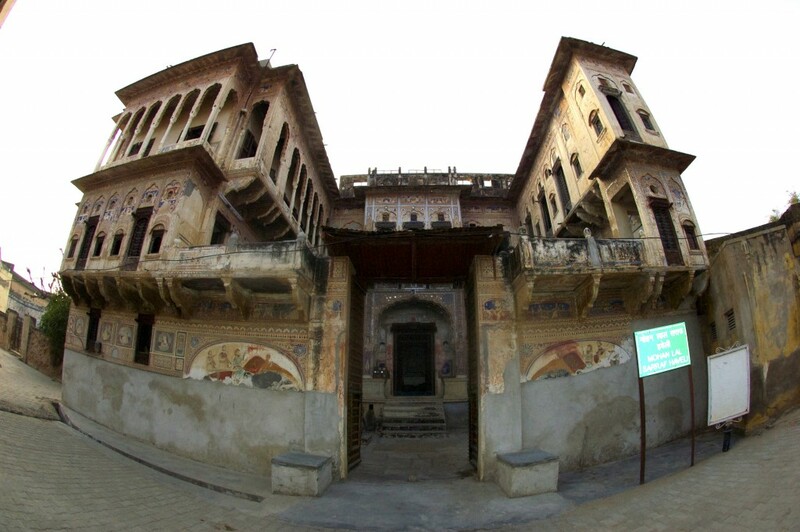 Thakur Nawal Singh, the Rajput ruler of Nawalgarh and Mandawa, built a fort in 1755 to protect this outpost. The township that grew around the fort soon attracted a large community of traders, who settled there permanently. Wealthy merchants built beautiful havelis for themselves and their families which are considered to be the most elaborate and beautifully decorated havelis in India. Presently, a small village of 20,000 people is a popular stop for many Rajasthan-bound tours, however, I haven’t seen a single tourist during my 5 hour exploration around Mandawa. After checking into Hotel Shekhawati, I was offered to take a guided tour around the town for Rs.200. It was already late afternoon and I figured it would be wise to be accompanied by somebody who could not only be my guard but also a story-teller. A young well-dressed man, whose name sadly escaped me, escorted me to the streets of Mandawa. He briefly told me about the history of the town and then led me to a large elevated site with a water well and some religious constructions. My guide explained the purpose of each well and how they used to serve the citizen of Mandawa. Obviously, they are no longer in use, however, they proudly stand and wait for their time to be in use again. From the well platform, I could see the beautiful havelis and houses resembling old palaces with people going about their lives. 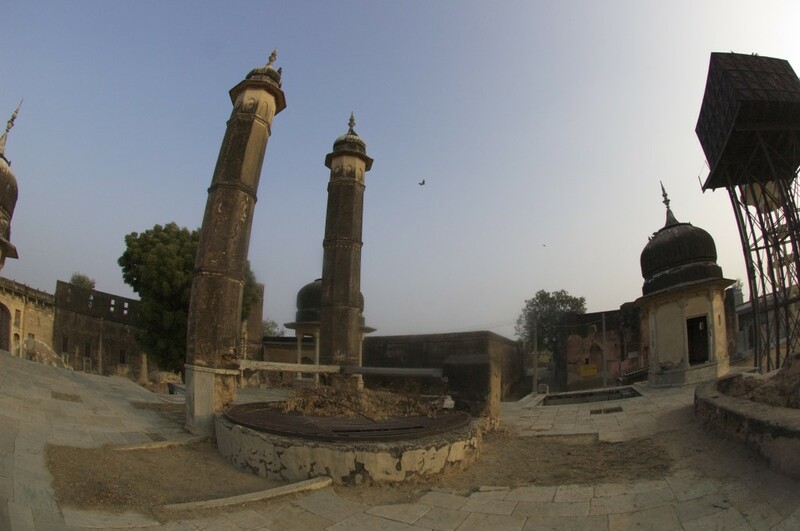 Across from the well, a lavish palace that once, perhaps, was the jewel of Mandawa appeared to be in a pitiful state, dilapidating and crumbling before my eyes. Nevertheless, it was still a palace and people still lived inside. Sadly, many houses and old havelis in Mandawa were in terrible state of preservation, but maybe it added charm to this small village. Even though, I am very curious and like to look into every nook and cranny, the evening was setting in and we had to rush to see at least one haveli in details. We stopped by a few houses on the way and my guide pointed at the few interesting details of one or another house, and in a few minutes, we arrived to Mohan Lal Sarraf Haveli. After paying Rs.100 entry fee, my guide invited me in. Obligatory, the entrance was a doubled door, serving both as an elephant gate and a people’s entrance door. However, both doors were open for us. The outer courtyard was a man’s domain where the men of the family met and entertained their guests, did business transactions and slept. 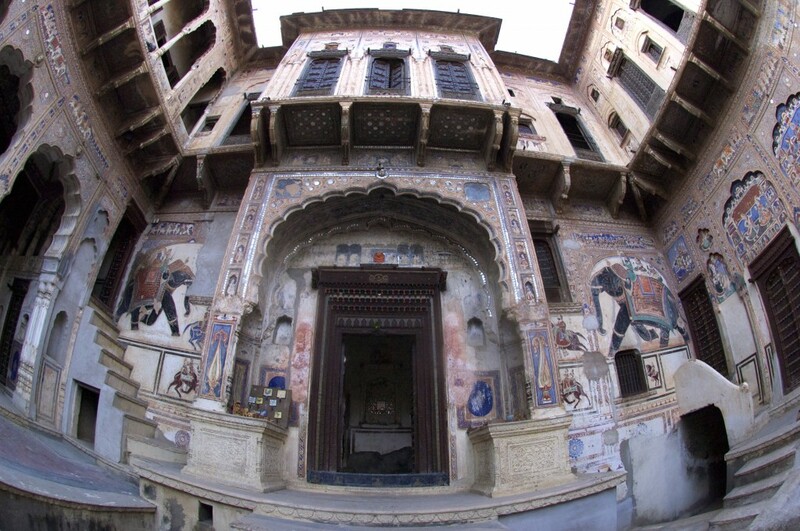 For those reasons, it was the most lavishly decorated part of the haveli with incredible carved arches and delicate paintings of elephants, dancing women, galloping horses etc. Guards, occupying one of the former sleeping loggias of the merchant didn’t pay any attention to us and continued to play cards. The smaller entrance to the heart of the haveli – its women quarter – was inevitably decorated with a string of green peppers and lime, to protect from evil spirits. It felt odd since no one lived in the haveli for a very long time. 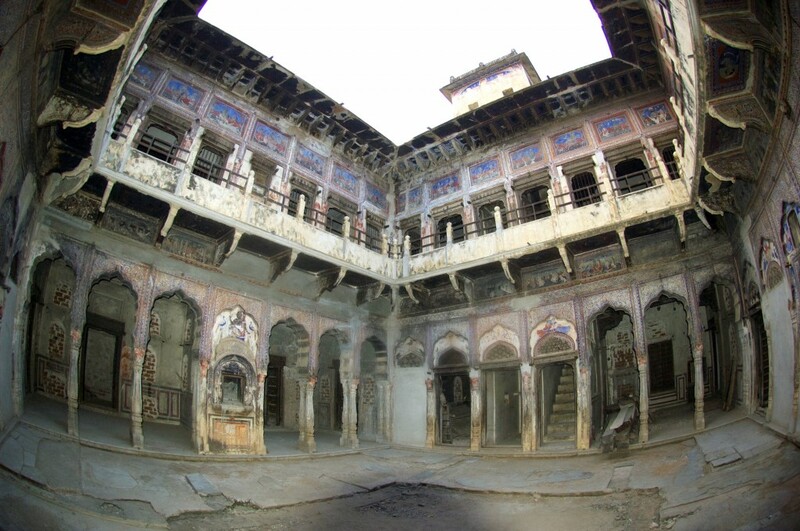 The inner part of the haveli represented a large courtyard and staircase leading to the second floor living quarters and a rooftop. The floor was almost non existing, some wall parts were replaced and patched up, however, the paintings did remain just as vivid and colorful as they were in mid 18th century. Some rooms were women’s bedrooms with wonderful walk-in closets and built-in wall-shelves, some served as cooking and storing rooms. Balconies were decorated with stunning latticework and the rooftop presented an amazing views of the sun setting over the village. Indeed, the haveli required some work to make it livable again but according to my guide, it was up for grabs for only $40,000. It was getting dark and cold very fast, I wish we had time to see more of Mandawa but my guide decided to make a stop at his “friend” art shop where they tried to sell me Indian miniatures. The paintings were indeed beautiful and skillfully painted, but I neither had spare money nor expertise to make an educated purchase. After telling me 1001 stories about everything, including how in 1979 he got a iron from USSR which worked till present day, the owner of the shop let us go. By the time we got back to the hotel, my dinner was already served. I can’t be sure whether I was the only guest at the hotel but I was definitely the only person in the restaurant. 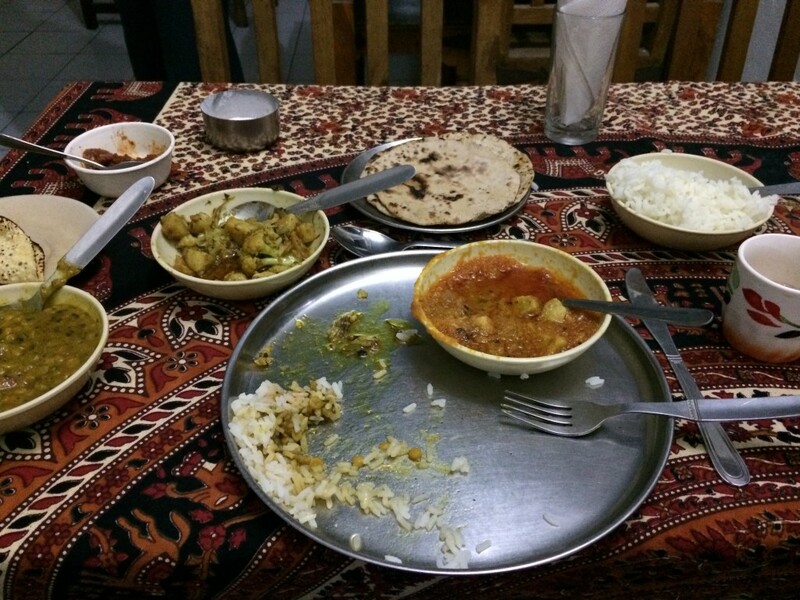 I ordered a typical Rajasthani dinner with soup, gatta vegetables, dal, rice, chapati and papad, all for Rs.225. Despite cold, my guide didn’t put anything on and stayed in his sweater. Later, talking to him I found out that he just got married and his wife and a newly born son (which he was very proud of) are staying in another state with his parents, while he is working in Mandawa. Simply, he didn’t have a jacket because he sent all the money to his family and didn’t have another set of presentable clothes to work with tourists. Sad, because his friend art-dealer was trying to sell me a painting for $180 while my guide was penny pinching so he could send all the money to his father so that his father could take care of his young wife. The deal was Rs.5000 a month, otherwise, she must go. This is Indian life. In the end, I invited him for dinner, paid his fees and tipped him well. This entry was posted in Asia and tagged Amritsar, Bhojraj Ji Ka Subsub, Bikaner, chapati, dal, Delhi, gatta, haveli, Hotel Harasar Haveli, Hotel Shekhawati, India, Indian life, Indian people, Jat, Jodhpur, Mandawa, Mandu, Mohal Lal Sarraf Haveli, Mr. Bubbles, Mr. Vishwajit Singh Harasar, Nawalgarh, Oxford, Oxonian, Papad, papadum, poverty, Rajasthan, Rajput, sadness, Shekhawat, Shekhawati, thakur, Thakur Nawal Singh, Thikana, well. Bookmark the permalink.